pe_plotHarmonics(loggingNode) plots a bar chart of percentage of fundamental magnitude versus harmonic order of the simscape.logging.Node of an AC or periodic variable. The title of the bar chart includes the fundamental frequency, fundamental peak value, and total harmonic distortion (THD) percentage. You enter the input arguments in a specific order. The Simscape™ logging node input argument is required. All other input arguments are optional and have default values. If you are specifying a value for a subsequent optional input argument, enter  to use the default value for an optional input argument. Find the points in the ith signal (valueIdx) where the Simscape log crosses a threshold (offsetOfInterest). Use the crossing points to find the required number of periods (nPeriodOfInterest) preceding the specified time (tOfInterest). Calculate the harmonic magnitudes, up to and including the required number of harmonics (nHarmonic). Input the down-selected data to the Goertzel algorithm, which calculates the harmonic magnitudes up to and including the required number of harmonics (nHarmonic). The pe_getHarmonics function uses threshold crossing points to determine the fundamental frequency of the data. If your input data is noisy or crosses the threshold more frequently than half of the fundamental period, filter it before you use the pe_plotHarmonics function to plot it. The pe_plotHarmonics function then inputs the harmonic orders and harmonic magnitudes to the pe_calculateThdPercent function to calculate the THD. pe_plotHarmonics(loggingNode,valueIdx) uses the index into value data. pe_plotHarmonics(loggingNode,valueIdx,tOfInterest) uses the simulation time. pe_plotHarmonics(loggingNode,valueIdx,tOfInterest,nPeriodOfInterest) uses the number of periods of fundamental frequency. offsetOfInterest) uses the DC offset. offsetOfInterest,nHarmonic) uses the number of harmonics. This set of function arguments uses the Simscape logging node simlog.Load.V, which contains data from a three-phase voltage. 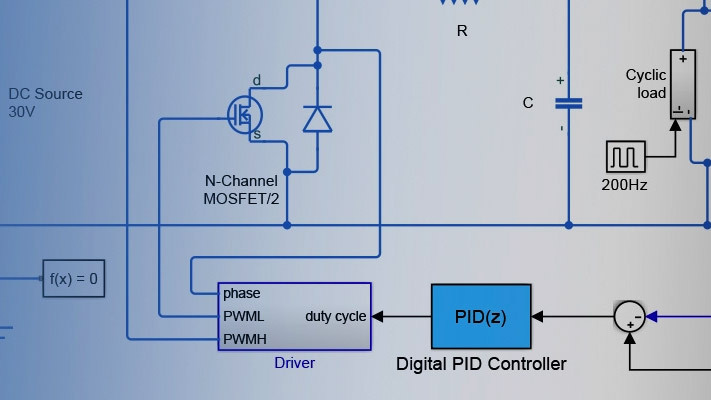 The function analyzes the default signal, which is the first, or a-phase, signal at the final simulation time. The function uses the default values of 12 for the number of periods of the signal, 0V for the signal bias, and 30 for the number of harmonics. This set of function arguments uses the Simscape logging node simlog.Load.V, which contains data from a three-phase voltage. The function analyzes the second, or b-phase, signal at a simulation time of 2.3 s. The function uses 10 periods of the signal, which has a bias of 1 V. The function analyzes 15 harmonics. This set of function arguments uses the Simscape logging node simlog.Load.V, which contains data from a three-phase voltage. The function analyzes the first, or a-phase, signal at a simulation time of 2.3 s. The function uses the default number (12) of periods of the signal, which has a bias of 1 V. The function analyzes the default number (30) of harmonics. Simscape logging node, specified as a 1-by-1 simscape.logging.Node. You create a simscape.logging.Node by running a simulation with Simscape logging enabled. To learn how to enable data logging, see Enable Data Logging for the Whole Model (Simscape). The Simscape logging node simlog.Load.V contains data from a three-phase voltage. Index into value data, specified as a scalar. Specifies the ith variable of interest in the Simscape log. Specify the b-phase, which is the second signal from a three-phase voltage. Use  to specify the default value of 1. The a-phase, which is the first signal from a three-phase voltage, is the default signal of interest. Simulation time of interest for harmonic analysis, specified as a scalar. Specify a 2.3s simulation time. Number of periods of fundamental frequency to be included in harmonic analysis, specified as a scalar. Specify 10 periods of the signal. DC offset in the input signal, specified as a scalar. The function uses this value to find the periods of interest. Specify a bias of 1V for the signal. Number of harmonics to include in analysis, specified as a scalar. Specify that the number of harmonics to be analyzed is 15. The pe_plotHarmonics function will be removed in a future release. Use the ee_plotHarmonics function instead. The only difference between these functions is the function name. To prevent your code from generating an error when the function is removed, update to the new function name.